The Demonstration focused on Prelocentre‘s GenDrive-Powered forklift fleet. 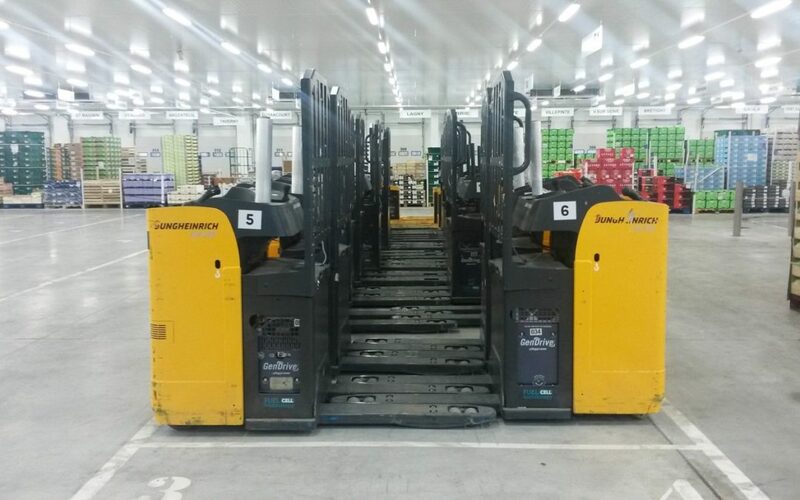 Saint-Cyr-en-Val, France—MM&D reports Plug Power Inc. took part in a tour of Europe’s first warehouse with a fleet of forklift trucks 100 percent powered by the company’s GenDrive hydrogen fuel cells. The Prelocentre site is the first logistics center in Europe deploying only fuel cell-powered material handling vehicles. It will operate 40 trucks by the end of 2016 and 60 in 2017. The lifts run on hydrogen vs traditional battery operated lifts. The tour, organized by HyLIFT-EUROPE, in cooperation with Prelocentre and Air Liquide, was designed to let members of the logistics industry and local officials see the productivity and sustainability impact that hydrogen-powered fuel cells have on a Distribution Center. It took place on June 7, 2016, at the Prelocentre distribution centre in Saint-Cyr-en-Val, France. Air Liquide sets up a hydrogen station in the first all-hydrogen warehouse in Europe. he Air Liquide hydrogen station enables to recharge a forklift in 3 minutes only, providing an 8-hour driving range on average. The event included a site tour focused on the GenDrive fuel cell-powered fleet being refueled by an indoor hydrogen dispensing system. Plug Power’s GenDrive fuel cells are a drop-in replacement for lead-acid batteries in electric material handling vehicles. GenDrive fuel cells provide continuous power to the truck at all times, even in freezer environments as low as negative 30 degrees Celsius (negative 22 degrees Fahrenheit). Battery degradation and untimely trips to the battery room are eliminated. Prelocentre Director, Philippe Giroux and General Manager for Hypulsion-Plug Power Europe, Jose Luis Crespo spoke at the event. Local authorities and executives from the Fuel Cell and Hydrogen Joint Undertaking (FCHJU), Air Liquide and Colruyt, a grocery store chain that has also invested in Plug Power’s GenDrive hydrogen fuel cell solution for its European distribution centre also welcomed tour participants. HyLIFT-EUROPE and HyLIFT-DEMO are projects undertaken by HyLIFT and co-financed by FCHJU. The two organizations have supported the development and demonstration of European-manufactured fuel-cell powered material handling vehicles and hydrogen recharging infrastructure since 2009.